I HAD KNOWN LONG BEFORE I rode a covered wagon to Oregon that naïveté was the mother of adventure. I just didn’t understand how much of that I really had. Nicholas and I realized before we left Missouri with the mules that we would be the first wagon travelers in more than a century to make an authentic crossing of the Oregon Trail. But that was never the point for us. We pushed mules almost two thousand miles to learn something more important. Even more beautiful than the land that we passed, or the months spent camping on the plains, was learning to live with uncertainty. The trip was my idea, and I fell into it in my usual barmy way. A few summers ago, while taking an afternoon off from a story I was working on in the Flint Hills of Kansas, I stopped on the road near a stout granite monument that marked a set of wheel ruts disappearing northwest across the plains. Enchanted by the idea that I could step from a modern paved road onto the tracks of the nineteenth-century pioneers—not to mention walk all the way to Oregon—I paused just long enough to grab a water bottle and a brimmed hat from my car and set out along the ruts, heading west. It was a beautiful, breezy day, with sprays of yellow coreopsis blooming above the grasses and meadowlarks bobbing over the hills. The old ruts sloped over several gentle rises, past clumps of cottonwood trees and low shrubs at the watercourses, and handsome timber bridges that crossed two streams. The expansiveness of the landscape was hypnotic and physically exhilarating, and after the first mile I felt as if I were levitating on the plains. The distant hills of Nebraska seemed to draw my vision hundreds of miles away. A few miles up I stopped to admire the view after climbing a steep rise. The valley below was one of those dreamy western vistas out of an Albert Bierstadt painting—a U-shaped canyon framed on one side by a large stream and on the other by green and brown hills. In the middle, a tidy group of shingled rooftops glowed orange in the sun, surrounded by browsing cattle. I walked down to the stream, where a sign announced that I had reached the old Hollenberg Ranch and Pony Express station along the Oregon Trail. The restored ranch and Pony Express station are maintained by the Kansas State Historical Society, and at the interpretive center there, built near a modern parking lot, I learned about the place. Gerat Hollenberg was a German immigrant who had first crossed the Oregon Trail during the 1849 California Gold Rush. He made a small fortune in the northern California gold fields, then lost it in a shipwreck off Florida, and was drawn back to Kansas in 1854 by his memories of the beautiful prairie and dreams of founding a business along the busy covered wagon trail he had seen five years before. At the time, marginalized American farmers “westering” for cheap land in the Northwest, religious zealots, and just dreamers in search of adventure were flooding across the Kansas frontier, and in peak years as many as fifty thousand covered wagon immigrants spent the summer crossing the Oregon Trail and its two main tributaries, the California and Mormon trails. Entrepreneurs intent on profiting from this traffic were building a network of “road ranches” along remote stretches of the trail, providing a kind of early log-cabin convenience store for the passing wagons. Hollenberg selected a site along Cottonwood Creek to attract pioneers who needed to water their draft animals and replenish their drinking barrels at the end of their first week crossing the prairie, and apparently he chose well. The trading post and wagon-repair shop he built on the plains—later, his wife added an outdoor kitchen and sold hot meals—were quickly heralded in published trail guides as the last major layover until Fort Kearny in Nebraska, two hundred miles away. I was intrigued by one display at the interpretive center, lying flat in a glass case. It was a facsimile reproduction of a journal entry made in May 1850 by an Oregon Trail pioneer from Indiana, Margaret Frink, describing the scene from the rise above the river that I had just left. Today, the Hollenberg Ranch sits on a lonely, deserted spot on the hilly plains, with only the green vastness of the prairie grasses, and the mosaic of yellow and purple flowers climbing the low rises, filling in the view. But Frink’s 1850 journal entry described a starkly different place, a scene that could only be imagined 157 years later, looking out over the empty hills. In the afternoon we came to the junction of the emigrant road from St. Joseph with our road. . . . Both roads were thickly crowded with emigrants. It was a grand spectacle when we came, for the first time, in view of the vast migration, slowly winding its way westward over the broad plain. The country was so level we could see the long trains of white-topped wagons for many miles. It appeared to me that none of the population had been left behind. It seemed to me that I had never seen so many human beings before in all my life. That was the moment when I first felt the rush of a dream about the Oregon Trail, but the thought quickly passed as I moved on to the other exhibits. They were mostly reproductions of paintings of the Kansas hills during the 1840s and 1850s, when dust billowing up from the wagon trains created a haze all the way to the horizon, collections of old wheel hubs and shards of harness unearthed during archeological digs, and a description of the ranch’s use as a Pony Express station and stagecoach stop in the 1860s. The site administrator from the Kansas Historical Society, an elderly man named Duane Durst, stood behind the counter as I walked through the museum entrance. Duane was talkative and obviously lonely, glad to have some company for the afternoon. He was a retired farmer and feed mill manager from the nearby town of Washington, Kansas, who had spent most of his life studying the patchwork of nineteenth-century “feeder trails” in eastern Kansas that led to the beginning of the main Oregon Trail nearby. This network of roads was called the “junction country” of Kansas, and in many spots near Durst’s farm, the remnants of the old wagon ruts are still visible in unplowed pastures and stream crossings. He was exactly the kind of walking database I enjoyed meeting on such a day, and I was quickly drawn in by the details he shared. The feeder trails that moved northwest through Kansas and then disappeared beyond the Flint Hills all emptied into the original Platte River Road, as it was initially called, the main fur-trapping route to the Rockies that passed through the Arapaho and Sioux tribal lands in western Nebraska in the 1820s and 1830s. 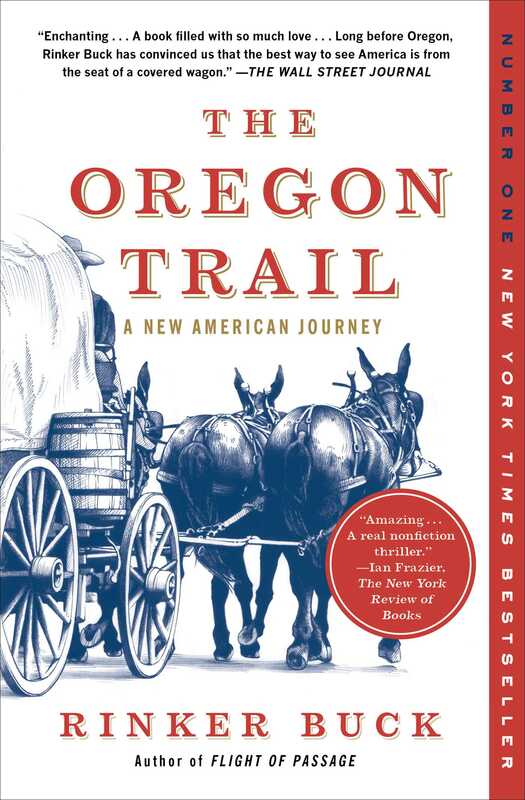 Renamed the Oregon Trail in the 1840s, the route spanned some 2,100 miles from jumping-off towns such as St. Joseph and Independence, Missouri, to the Willamette Valley in Oregon, following the great river valleys of the West through five present-day states—Kansas, Nebraska, Wyoming, Idaho, and Oregon. Unlike the image projected in Hollywood westerns, where covered wagons are pulled by attractive teams of matched Percheron and Belgian horses, oxen and mules were the preferred draft animals, Duane told me. Horses require too much forage and they couldn’t take the heat and the long stretches between reliable sources of water. Many more immigrants were dispatched by shooting accidents and wagon crashes than were killed by Indians, and the river crossings were often treacherous in the spring, costing many pioneers their lives. But by the fall, families regrouped. At major stopovers like Soda Springs in Idaho, or Farewell Bend in eastern Oregon, the long wagon trains paused while partners widowed by the rivers remarried, and the festivities often lasted for three or four days. My curiosity was aroused by another detail that Duane shared. Pulling from his wallet a laminated ID card, he told me that he was a twenty-five-year member of the Oregon-California Trails Association, the main preservationist group for the trail. Duane described himself as a “rut nut,” and his commitment to the group was pretty typical. Over the past twenty years he had rescued several Oregon Trail markers and monuments that had been overrun by farming and other development, relocating them closer to traveled roads where they could be seen. He had helped design and build a visitors’ center at the Hollenberg Ranch and created Oregon Trail education programs for local schools. An Oregon-California Trails Association newsletter that Duane gave me described how the group’s volunteer work crews fanned out on summer weekends across broad expanses of the West, restoring mile markers along the trail, checking fence lines for land encroachments, and preserving trail grave sites in Wyoming and Nebraska. Feelings of inadequacy overwhelmed me as I listened to Duane. I am an obsessive-compulsive reader and a history junkie. I brake by rote at every historical marker, I buy out museum bookstores, and for years my interest in colonial forts and Shaker villages so exhausted my two children that they are now permanently allergic to the past. I can tell you, right down to the hour, everything that happened at Gettysburg, Pennsylvania, during the first week of July 1863, and each setback that Franklin Roosevelt endured during World War II feels like it happened to me. Frequent summer junkets to Montana and Wyoming had convinced me that I knew a lot about the American West. But now, on a perfect Kansas day, at an exquisite historical site, I was listening to a rut nut empty his brain on the Oregon Trail, and I realized that I didn’t know a thing about it. How could I have missed so much about so iconic an American experience? And what Duane told me next seemed even more astonishing. Today, almost the entire 2,100-mile expanse of the Oregon Trail—even where it has been covered over by modern highways or railroad tracks—has been meticulously charted and marked, with long, undeveloped spaces now preserved as a National Historic Trail. Except for two bad stretches of suburban sprawl around Scottsbluff, Nebraska, and Boise, Idaho, most of the rest of the trail is still accessible along remote farm and ranch roads in the West. In western Nebraska and central Wyoming, where the trail runs through relatively undisturbed federal lands or immense private ranches, there are still more than six hundred miles of original wagon ruts, just like the path I had hiked that day. The dreamscape chain of natural landmarks and river views that the pioneers saw—Signal Bluff and Chimney Rock along the Platte, Devil’s Gate on the Sweetwater, Rendezvous Point at the Green—is all still there, virtually intact. When Duane began describing the trail, he handed me a foldout map published by the National Park Service, and I followed along as he spoke. End to end, the map stretched almost four feet across the counter, depicting an immensity of terrain, almost completely devoid of urban development, from the banks of the Missouri River at Kansas City to the end of the Columbia River gorge near the Pacific coast. The colored terrain shadings on the map looked like platters holding a giant smorgasbord of geology—plains, bluffs, high desert, and dramatic river gorges—along the route west. To me, the Oregon Trail had always been just another historic nameplate, like Manassas or Pikes Peak, but now the map in front of me was opening it up like a tableau of the enormous energy of the American experience. The visual prompt of the map was irresistible, and I formed a strong mental image as I looked out through the paned windows to the endless plains beyond the groves of cottonwood trees that curled along the floodplain of the Little Blue River. In my mind’s eye, a dusty two-track trail curved northwest into the mystery of Nebraska, and then disappeared into the snowcapped rim of Wyoming’s Medicine Bows. The map, the hypnotic Flint Hills rising and falling all around me, the peaceful surroundings of the ranch, seemed an invitation to ramble. Who wouldn’t, given the chance, want to ride the trail end to end? Wanderlust has always acted like amphetamine for me and I could not prevent my head from making the next leap. St. Joe to Farewell Bend in Oregon in a covered wagon. More than two thousand miles of open country to cross. What a dream. Duane looked at me quizzically, as if I were asking a question that he’d never heard before. The modern trail, he explained, mostly existed as a tourist attraction. Families driving west in their RVs—headed for Yellowstone or Glacier National Park—stopped out of curiosity when they saw signs identifying Oregon Trail sites. Most of them just wanted to quickly read a brochure and then find the next campsite with a cable TV hookup. After poking around the grounds and the Pony Express station for a while, I stepped back inside to say good-bye to Duane, and then hiked back east across the rise. The words of Margaret Frink had stayed with me, and I stopped at the top to look back. It was tempting to look across the hills to Nebraska and imagine long trains of white-topped wagons for many miles, with men hollering at teams, whips cracking, and hundreds of wheels raising dust, while outriders galloped through the grasses to flush up game. At this time of day the river bottoms all the way to Nebraska would be obscured by gray clouds of smoke, as the pioneers stopped their trains for the night and cooked deer steaks and prairie chickens for their evening meal. But the plains were quiet now, the air crystalline. The cedar roofs of the Hollenberg Ranch, lit pink and amber by the falling sun, were all that I could see. It was almost dark by the time I got back to my car. Dusk is my favorite part of the day, a time for expansive thoughts, and as I drove south my mind wandered back over the ruts and the vision of a journey that I had seen on a map at the Hollenberg Ranch. I dreamed about it all the way back to Topeka. Buy a team of mules and a covered wagon, jump off from St. Joe, and then spend an endless summer rusticating way out there, revived all day by the clangor of harness chains, the scent of mules sweating, and the vast soulful horizons of the West. I would camp at night at old pioneer stops and Pony Express corrals, soothed by the rushing waters as I fell asleep beside the Sweetwater or the Platte. It was a completely lunatic notion. Except for the occasional faux reenactments staged for tourists by Wyoming outfitters—modern-day “pioneers” are trailed by convoys of sumptuously appointed RVs, and pampered at night with portable showers and catered meals—no one traveled more than sixty or seventy miles of the trail today. I would later read, in a history of the trail years and the subsequent homesteading period in the late nineteenth century, that “the last documented crossing of the trail occurred in 1909.” Just to reach my rendezvous with dementia out along the banks of the Missouri River, I would spend two or three days driving west from my home in New England with my gear loaded into a pickup. Then I would spend four months, via covered wagon and mules, crossing what nineteenth-century travelers called the “Great American Desert.” Across the high deserts of central Wyoming and Idaho, I would have to cover stretches of forty miles or more without water. And why did I think that the notorious and often fatal obstacles that the pioneers faced—mountain passes strewn with lava rock, hellacious winds and dust storms, rattlesnakes, and descents so steep that the wagons could only be lowered by ropes—would miraculously vanish from the trail for me? Only a delusional jackass, or someone seriously off his medications, would pull off the road at the Hollenberg Ranch one fine summer afternoon and concoct such a preposterous scheme. But you can’t save an addictive dreamer from himself, and that jackass happens to be me. Already, powerful forces were drawing me west. I felt an irresistible urge to forsake my life back east for a rapturous journey across the plains. The contagion of rogue travel started early with me. I was raised during the 1950s and early 1960s on a ramshackle old horse farm in New Jersey. My father, a magazine publisher in New York City, was boundlessly energetic and inventive, devoted to what he considered the pressing entertainment needs of his eleven children. While the rest of the country raged over Pontiac tailfins or played golf, we chased around the menagerie that my father had slapped together from a nineteenth-century dairy—barns converted to horse stables, chicken houses and goat pens, a collection of more than twenty-five antique carriages and wagons, and a large stone patio and picnic area set under giant shade maples, where my father entertained the lovable drunks from his local chapter of Alcoholics Anonymous. We drove to church every Sunday in a four-seat surrey pulled by a team of matched bays, and sleighed into the toy store in town in December to pick up our Christmas presents. On lazy summer nights, my father loved nothing more than loading his children and all of our neighborhood friends—there could be twenty kids or more—into the dilapidated yellow school bus that he had purchased at a junkyard for such outings. Then we drove down to the Dairy Queen in Bernardsville and gorged on ice cream sundaes. Over the winter of 1958, brooding in front of his fireplace one night, my father announced that he was bored with the school bus. As a family, he thought, we needed an experience that would draw us together, something that would engender in us the spirit of the American pioneers. I don’t have any idea where this notion came from. But the top-rated American television show that year was NBC’s Wagon Train, starring Ward Bond, and we were all fans. We didn’t consider it outlandish when my father told us that, for our summer vacation, we were going on a covered wagon trip to Pennsylvania. It would be a combined camping and coaching expedition, with stops along the way at historic sites like Valley Forge and Gettysburg that my father wanted his children to see. My father had a knack for making the complex seem simple, and we were relaxed about our preparations for the trip. One January weekend that year we drove down to the Pennsylvania Dutch country in Lancaster County and made arrangements with our regular Mennonite wagon builder, Jonas Reif, to convert a large farm wagon with hoops and a canvas top. We bought our draft horses, a team of Percheron-Morgan crosses named Benny and Betty, from Jonas’s son-in-law, Ivan Martin. My father, my older brother, and I spent a few delightful Saturday afternoons that spring banging around the barn with rusty hammers and saws, modifying our rig with racks for cooking pots and pans, hooks for water buckets, and a drop-down chuck wagon table for cooking meals. My father was a former barnstorming pilot and World War II flight instructor who had lost his left leg in a bad air crash in 1946. He stowed his maps for the trip in an old woolen stump sock that he placed underneath the wagon seat. With shoelaces, he hung a compass and a clock from the hoop over the front seat. We clattered down our drive early one Saturday morning in July that year, bound for Pennsylvania, and that was a beautiful junket for a father to share with his children. I was seven years old and our covered wagon trip was the dream summer of my youth. In those days New Jersey and eastern Pennsylvania were still undeveloped, and we drove down through the green farmlands of Somerset and Hunterdon counties on quiet state highways or dirt roads, camping at dairies and state parks. In the mornings, while the waters of the Delaware or the Schuylkill river gurgled past our campsite, my father would rise at dawn and cook up a big breakfast of scrambled eggs and home fries over a wood fire, while my older brother and I fed and watered the horses. Along the cool, shaded lanes of Bucks County, Pennsylvania, we sang songs together to pass the time, and took turns learning to drive the team. On warm afternoons the bumping of the wheels over gravel roads and the rhythmic clopping of hooves made me sleepy, and I loved stretching out in the back of the wagon and napping on a bale of hay.